Home › Blog › Our x-ray tube high voltage cable is improving. Newheek X-Ray specialise in the design and manufacture of High Voltage Medical X-Ray cable assemblies and Receptacles to fit all makes and designs of medical equipment. Newheek X-Ray cable has been selected for its flexibility, low noise and excellent high voltage characteristics giving it a large operating voltage safety margin. A range of cable accessories including mounting flanges, insulation paste, contact pins and receptacle blanking plugs are available. 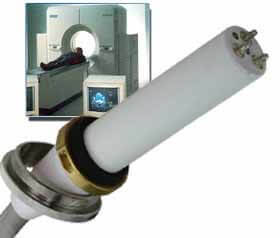 Chassis mounted generator and x-ray tube receptacles are available to connect your equipment to the X-ray cables. Other cable types available are Industrial X-ray, Analytical & Scientific, High Energy and Pulsed Power, Receptacles and Custom Design. Newheek X-Ray would be pleased to discuss your HV cable interconnect requirements. Contact us.